What Can I Do With an Online Doctorate in Criminal Justice? An online Ph.D. in criminal justice is a lucrative credential for professionals already working in the field or for recent graduates of bachelor’s or master’s programs exploring career opportunities. An online Ph.D. in criminal justice strengthens critical-thinking, research, and leadership skills for careers in higher education, administration, research, and policy analysis. The Bureau of Labor Statistics projects a 12% increase in jobs for criminal justice postsecondary educators by 2026, which is higher than the national average for all occupations. This guide describes what to expect in a criminal justice doctoral program and discusses common career paths and salary expectations. An online PhD in criminal justice will put you on the path to furthering your career, without having to sacrifice your job. There are many options available, but it’s important to find a program that meets your state’s needs for application to the bar exam. Students can also choose from a number of concentrations in order to work toward what meets their personal interests and career goals. 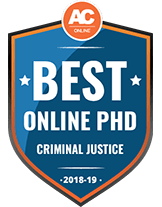 To find the right program, check out the top online PhD program in criminal justice for 2019. While a master’s degree prepares graduates for many rewarding positions, an on-campus or online criminal justice Ph.D. program leads to more career paths with access to leadership roles and greater earning potential. The expansion of jobs for criminal justice professionals in law enforcement, corrections, and security spurs the demand for teachers and trainers. Many graduates of online criminal justice Ph.D. programs find employment in academic institutions, teaching at the undergraduate and graduate levels and conducting specialized research. Many postsecondary schools require a doctorate to become a college professor. A doctorate qualifies law enforcement officers, federal agents, and security specialists for managerial and supervisory roles. The skills acquired in online Ph.D. in criminal justice programs equip graduates for employment as college professors, forensic scientists, security analysts, policy advisers, and consultants. The degree provides a competitive edge to those seeking administrative positions in law enforcement, correctional organizations, state and federal governments, and private businesses. Ph.D. holders contribute to pure and applied research, designing and conducting studies that tackle social issues. Recent research in law enforcement subareas address the causes of juvenile delinquency, best practices in domestic violence cases, and sentencing disparities among racial groups. Researchers focused on corrections and rehabilitation might investigate proposals for prison reform, alternative sentencing approaches, and restorative justice models. Graduates of online Ph.D. programs in criminal justice enjoy upper-level positions in education and research, policing, corrections, public affairs, and courts and legal offices. Compared to a bachelor’s or master’s degree, a doctorate typically leads to positions with greater autonomy and higher salaries. Criminologists study and teach the causes and consequences of criminal behavior. They find employment in colleges and universities, law enforcement organizations, government agencies, and policy institutes. Postsecondary educators teach criminal justice and related courses at community colleges, four-year institutions, and professional schools. Their responsibilities may include advising students, serving on committees, and conducting research. Governments, nonprofits, and consulting firms employ survey researchers to design and implement research projects, collect and analyze data, apply statistical software, and evaluate findings. They must have a strong background in research methodology and statistical analysis. While salaries generally increase with advanced graduate training, the job outlook for graduates of online criminal justice Ph.D. programs depends on specialization, employer, and experience. For example, criminal justice postsecondary teachers earn between $36,150 and $110,020, with doctorate holders enjoying the highest earnings. The highest-paying employers for these educators include business, computer, and management training schools, followed by colleges, universities, and professional schools. The median annual salary for survey researchers is $60,700, but they can earn up to $100,660 with graduate training and experience. Researchers earn the highest salaries working for management companies and scientific research and development services. Online Ph.D. programs in criminal justice usually require a master’s degree in criminal justice, criminology, or a related field. Some schools accept applicants with a bachelor’s degree for provisional admission. Applicants with a master’s generally do not need to submit GRE scores; bachelor’s degree holders may need to supply them. Applications typically require a personal statement outlining educational and career goals and letters of recommendation. Some programs may also request a writing sample and an in-person interview. Earning a Ph.D. in criminal justice online requires between 40 and 78 credits. Most full-time students graduate within five years, although some accelerated doctoral programs may be completed with two years of full-time study. Some programs include residency requirements, especially for predissertation research coursework and dissertation defense. This course approaches theories of crime and criminal behavior from a multidisciplinary perspective. Students apply biological, psychological, sociological, economic, and cultural perspectives to explain crime causation and criminal behavior. Students examine methods of assessing the potential for violent behavior, violence prediction, and the validity of risk assessments. The course emphasizes ethical issues and controversies involved in the assessment of violent behavior. Students learn the principles of social science inquiry, different research methodologies, and major applications in criminal justice research. Topics include how to conceptualize a research problem, formulating hypotheses, data collection, and report findings. This course addresses theories on the impact of abuse on victims and best practices in working with traumatized victims. Students critically examine the structure of domestic violence courts and offender-specific treatment programs. This course introduces students to contemporary issues in criminal justice leadership. Students analyze theoretical models and applications for a variety of settings, focusing on organizational function, processes, and accountability. Students also examine the role of leadership in shaping organizational responses to challenges. A criminal justice doctoral program begins with approximately four semesters of coursework in foundational areas and electives. Core courses typically include seminars on theories of crime and criminal behavior, research methodology, and advanced statistical analysis. Most programs allow students to choose a concentration or select focused electives, such as risk assessment, organizational leadership, and homeland security. Most online criminal justice Ph.D. programs require students to take comprehensive examinations before beginning dissertation research. Comprehensives may include one or more tests on specialized areas. They may be administered in written or oral formats as take-home or in-person proctored tests. After passing comprehensives, Ph.D. candidates select a dissertation topic and receive approval for their proposal from a faculty adviser or dissertation committee. Students may spend one or more years conducting original research on an issue in criminal justice, such as juvenile violence, global terrorism, or prison reform. Format, length, and other requirements vary by program. Ph.D candidates submit the finished dissertation to a committee for revisions and approval. As the final step, the committee requires students to appear at a formal defense, often open to the public, to answer questions about the research analysis and conclusions. After a successful defense, the committee issues approval for the candidate to receive the degree. A Ph.D. in criminal justice affords students skills including research, policy analysis, and leadership. Students gain a general understanding of criminal justice, including major theoretical perspectives and scholarship, and current challenges. Students acquire the methodological and statistical tools to conduct research and publish advanced scholarship for understanding crime and criminal behavior. Graduates learn the problem-solving, analytical, and writing skills needed to create national and regional criminal justice policies. A Ph.D. in criminal justice prepares graduates for teaching, advising, and research responsibilities in postsecondary institutions and professional schools. Graduates acquire the leadership skills and best practices needed in supervisory and management roles in state and local criminal justice agencies. Students learn approaches and applications to offer consulting and research services that address public safety issues and inequities in the legal system. While a Ph.D. is the terminal degree in criminal justice, graduates sometimes pursue certifications that demonstrate specialized knowledge and professional competencies. Certificates provide a useful credential for career advancement in specialized professions, including computer forensics and emergency management. Some occupations, such as addiction counseling and corrections management, require job applicants to hold certifications. Several organizations oversee criminal justice-related certification programs. The National Association of Forensic Counselors administers several voluntary clinical and nonclinical certifications. The American Society for Industrial Security offers the certified protection professional designation for security management specialists working in risk assessment, IT security, and cybercrime. Employers and credentialing organizations typically require applicants to have a Ph.D. from a regionally accredited school. Accreditation indicates that the degree-granting institution meets high academic standards and operates with financial integrity. Although the Academy of Criminal Justice Sciences awards programmatic accreditation to a small group of programs, currently no criminal justice doctoral programs hold this designation. Professional organizations represent the interests of researchers, practitioners, and educators in criminal justice. Joining a professional organization connects Ph.D. students with criminal justice researchers and practitioners and provides professional development opportunities. Graduate students who take active roles in organizational governance and specialized committees strengthen their professional networks and develop leadership skills that distinguish them in the job market. The ACJS sponsors conferences and workshops, publishes research, and oversees the ACJS certification program. Membership includes over 2,800 professionals, researchers, educators, and students in criminal justice and criminology. This international society addresses all aspects of criminal justice and criminology scholarship, research, and teaching. Students comprise 30% of ASC membership. The society hosts an annual conference, employment exchange, and career resources. The ACA represents the interests of corrections professionals by offering continuing education, training programs, and conferences. The ACA advocates for the establishment of accreditation standards for correctional organizations and administers the certified corrections professional program. The NCJA advocates for professionals working in all areas of criminal and juvenile justice systems. Student members receive access to networking events, free webinars, and discounted conference fees. The AAFSS advances forensic science and its application to law and criminal investigation. Student members may access job placement services and credentialing information. The AAFS sponsors an annual conference and publishes the Journal of Forensic Sciences.